Super capacity and stylish design are combined in the LG DLGX2802L gas dryer. Still, the product is more than just its physical looks and capability, the inclusion of True Steam Technology has brought to the consumer a whole new drying experience. Drying is no longer just about getting rid of every bit of moisture from garments but also about sanitizing or removing wrinkles and odor. 9 drying programs and 10 options should be enough to provide settings for every type of fabric and almost every need. There is a program for drying heavy duty loads and a program for drying delicates, for example. There are also wrinkle-free specific and sanitizing options that can add to the ease, convenience and hygiene of each cycle. True Steam Technology is mostly what makes the dryers from the SteamDryer series special. The use of this technology in the LG DLGX2802L is evident in some cycles and options. The SteamFresh cycle, for example, is a drying program that is especially designed to refresh some clothes that have gone musty-smelling over the time they were stored and not used. The SteamSanitary option, on the other hand, kills nearly a hundred percent of bacteria found on garments. This option can be used to clean non-washables, including childrenís toys. The LG DLGX2802L comes with cycles that operates at the optimum temperature. The SensorDry system is partly to thank for this. This system sets the right temperature and drying time for a certain load based on the detected amount of moisture in that load. There are 5 temperature levels to choose from. The Precise Temperature Control also takes part in ensuring that the right level is chosen. Wrinkle-free clothes are made possible through the LG DLGX2802L. The use of true steam is partly responsible. Steam, especially when set in the EasyIron and Wrinkle Care options should reduce the garmentsí creases. The dryer model comes in a beautiful Riviera Blue exterior. It is also available in either White or Wild Cherry. The door rim, whatever the general color of the exterior, is chrome with a silver edge. The door itself is made of transparent glass. 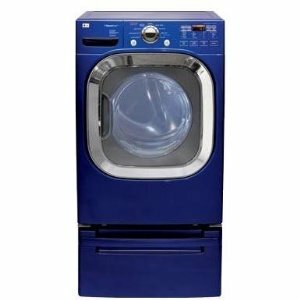 The LG DLGX2802L dryer is stackable with a compatible washer. So, the buyer should choose a washer that also comes from LG, especially a model that is specifically compatible to the LG DLGX2802L. The drum has a huge capacity. It is also made of NeveRust stainless steel, which makes it durable and rust-free and not just capable of holding a very heavy load. The control panel is made of plastic. The LED display shows the status of the cycle. The LG DLGX2802L dryer can effectively dry delicates and heavy duty loads because there are drying programs specifically designed for either. The control panel is easy to use. The dryer model is stackable and is, therefore, a space saver. The LG DLGX2802L dryer is neither ADA compliant nor Energy Star rated. Being a gas dryer, the model can be not allowed in some apartments.